If you’re watching the Target Facebook page right now, you’re seeing another social media disaster on par with Nestle’s debacle back in March. It’s like watching a train wreck in slow motion, but it’s another great case study for us about what not to do online. Hint: don’t set your page to show only your posts first and then abandon it when controversy arises. If you’re not familiar with the current controversy, you can go here to read about Target’s donation to a homophobic gubernatorial candidate in Minnesota. 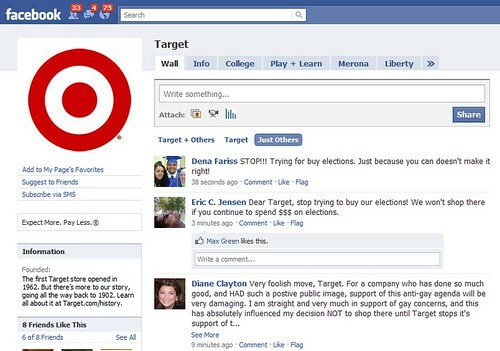 Be sure to click on “just others” on Target’s wall to see the angry, former customers and pornographic spam. I’m sure they’ve spent the last few days bringing in consultants to come up with a strategy for how to deal with this, but it’s surprising that someone hasn’t already said, “We need to at least post *something* on our Facebook page and acknowledge what’s happening.” So far, Target doesn’t seem to be learning from others’ past mistakes, so don’t fall into the same trap if this ever happens to you. I think that’s the biggest, immediate takeaway for libraries and nonprofits (well, for everyone, really), but personally I’m more fascinated right now by how people have been forced to give the term “like” different meanings in different contexts because of the box Facebook has forced them into, which this situation illustrates so well. We first saw this type of attempt to subvert the term “is” in Facebook’s early years. Long-time users remember when your status update automatically included the word “is” so you were forced to use adjectives, present progressive tense, or future tense. Nothing could happen in your past unless you were creative in your use of language, which some people went out of their way to be. Others just started ignoring the “is” and writing whatever they wanted. You might also remember the petition many of us “signed” asking Facebook to remove the “is.” It all seems so quaint now, but those two letters went from being a new way to describe ourselves to being too restrictive pretty quickly. Now we’re running into another limit that the Facebook one-size-fits-all box forces on us – “like.” We’ve all seen, and maybe even written, “dislike” on a friend’s status update when they say they have a cold or something bad has happened. And yet we still go ahead and click on “like” in order to signify some type of solidarity, even though the term is wholly inaccurate. Sometimes we specifically go out of our way to add a comment “I don’t really ‘like’ this” or “liking even though I don’t like.” But we don’t really have any other options, do we? And even though Mark Zuckerberg has said Facebook might someday add a “dislike” button (which it won’t out of fear users’ “dislike” of companies will drive advertisers away), that wouldn’t really cover it, would it? My range of emotions doesn’t run the gamut from A to B, but instead includes a million shades of grey in between, just as I don’t always talk solely in the present progressive tense. 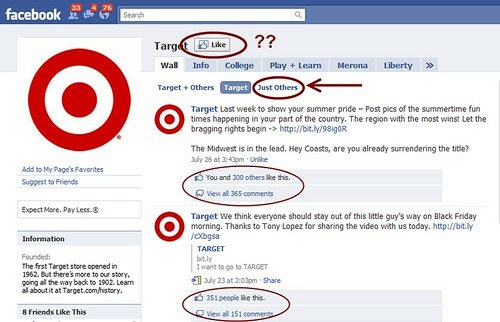 So when an issue like the Target controversy comes up and I want to leave a comment on Target’s wall saying I’m now boycotting them and why, I have to first “like” Target in order to leave that comment. Talk about cognitive dissonance. I can then add my thoughts and if I want to show support for other protesters, I can “like” their comments, which I do (some more than others), but “like” probably isn’t the word I would have chosen given my shades of grey. The only satisfaction I can really get is when I leave my comment and then “unlike” Target, but *that* update doesn’t get posted to my wall – only the “like” does. I recently read Jaron Lanier’s book You Are Not a Gadget, which for the most part I loved. I wrote a little about Lanier’s take on the future of authorship, but it also made me think about the way websites force our lifesize selves into one-size-fits-all templates. (Sorry I can’t quote a relevant piece, but I’ve lent my copy out, so I don’t have it handy – a blog post for another day.) At least software like WordPress lets bloggers choose from a variety of templates and even edit them, but it made me glad that I’ve personalized my own site to be truly unique, just like me. However, Facebook now has 500 million users, most of whom don’t have their own websites as a unique presence for themselves online. Instead, we have hundreds of millions of average users who all look the same and conform to Facebook’s interface constraints as their major representation on the web. If it wasn’t for the picture, it would be difficult to tell one John Doe FB profile from another in Google’s search results. The lowest common denominator used to be a yellow page listing, but now it’s become Facebook’s profiles. At least a Facebook user can personalize the text in her profile, but we’re all stuck with “like.” That word is taking on a lot more responsibility since we have to figure out ways to use it to convey other meanings. How do we indicate when “like” means don’t like, favorite, bookmark, agree, disagree, support, bummer, share, read this later, funny, and more? Facebook eventually wised up and removed the “is,” but how will it route around advertisers to provide the spectrum beyond “like?” It’s boxing itself, as well as us, into a corner, which I definitely don’t like. Interesting… it looks like the “Like” button is really an entrance fee/ticket, or the “door” to the event – it’s not really “liking” anything at all. At least in this instance, anyway. Probably in many instances, for that matter. Well said. Jaron Lanier’s point about the boxes that we type in somewhat determining what exactly we type into them has kept me thinking about this. Jessamyn, it’s *really* stuck with me because of ALA Connect. I want to find deeper ways for ALA members to customize their profiles however they want so that we’re not all in the same box. Unfortunately, there’s so much we want to do with the site that it will probably be next year before I can start exploring the best way to make that happen, but I’d love suggestions from anyone else thinking about this stuff. It’s also why I haven’t wanted to add the Facebook “like” button to Connect or ALA website pages. David, that’s an interesting way to look at it, especially when I consider that “comment” has worked just fine on blogs for a decade. At this rate, measuring “like” will be meaningless. May there should be buttons that said “FTW”, “Okay”, “Meh”, “WTF”? I think the best alternative to the “like” button would be a “follow” button. “Like” Thank you for so eloquently putting into words what I’ve been thinking about lately. Like also dumbs down, and diminishes conversation. It’s really easy to hit that button, but so much more meaningful to respond with a comment or story of your own. I think Facebook should go back to users becoming “a fan of” events and organizations rather than “liking” those events or organizations. (The English language is becoming corrupted enough, with “like” being thrown in all the time–there’s no need to have Facebook doing the same thing.) When people were “fans” or not, there was far less confusion, IMO. And to require “liking” something OR even becoming a fan of it simply in order to say one dislikes it is ridiculous. Thank you for this piece. I checked the Target Facebook page on August 11. It’s still a train wreck. If there’s a coherent response from corporate management, I can’t see it. There needs to be a way to prevent Facebook users from liking a page in order to comment; posting one or more poisonous messages that undermine the sense of community; immediately using the unlike link; then, repeating the process a few days later. I’ve seen this happen a lot on the NCLR (La Raza) Facebook page.